The most frequently encountered hummingbird for visitors to Quito, Ecuador and the inter-Andean valley is the Sparkling Violetear (Colibri coruscans). Widely distributed throughout the country from 1,000m to 3,500m (3,300 ft to 11,500 ft), its consistent "tik, tik, tik" calls attention to an ever-present guardian. The Sparkling Violetear is a beautiful and conspicuous hummingbird frequenting feeders and flowering plants, even within the bustling city limits. It is very territorial and can be seen habitually warding off intruders. This little hummer has grown accustomed to the dense population of the metropolitan areas and can be easily approached for photos. With an average length of 12cm (4 3/4 in. ), it has a slightly decurved bill of 25mm (1 in.). Its overall appearance is a glittering green with a brilliant violet-blue patch on the mid-belly. There is a post-occular spot and the tail feathers are a metallic blue. However, the most distinguishing feature of the Sparkling Violetear is the dazzling violet ear-patch that extends from the sides of the neck to the chin. When alerted to an interloper, it will extend the upper feathers of this patch to resemble ears. 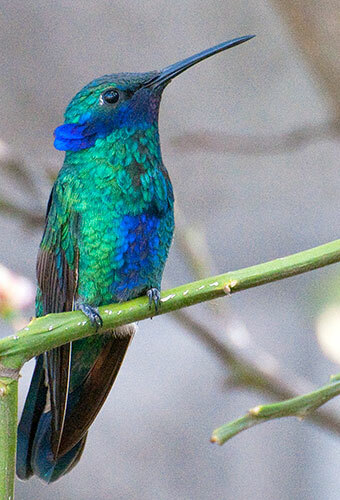 The Sparkling Violetear has been welcoming visitors to Ecuador for years. On your next visit to this inviting nation be alert to the zealous greeting from this entertaining resident.